Hello there everyone! It's Shay again back with another thank you card. I sort of channeled my inner Joni on this one. :-) Joni makes the most beautiful backgrounds and did a stellar job with creating floral backgrounds this past release as seen HERE. Ever want just "thank" rather than "thanks"? Me too! I played with the "thanks" from The Big, the Bold and You to create "thank" that I matched up with the "you" also from The Big, the Bold and You. Below you can see how I used some handy tape to cover up the "s" so that it would not ink up. 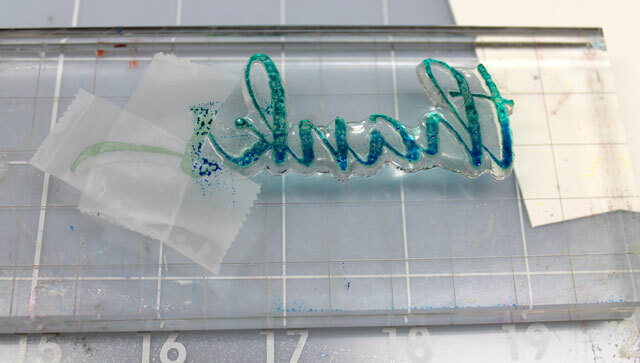 Simply peel off the tape before stamping (you don't know how many times I have to remind myself to remove the tape before I stamp). As you can see it stamped out perfectly! So love that. I wanted a fun variegated look so I stamped "thank" in peacock feathers and salty ocean Distress Inks (shown above) and "you" in festive berry and worn lipstick on a panel of watercolor paper. Then I painted over the words with a waterbrush that I dipped in Studio Calico's Mister Huey's Calico Shine. You are not be able to see it in the picture but in real life there is a pretty shimmer on the words. With the flowers from The Write Stuff: Leave it to Mom I created flowers in spun sugar and worn lipstick. The centers were stamped in festive berries using one of the solid circles from Scenery: Big Bang Confetti. The leaves are stamped in peacock feathers and are also from The Write Stuff: Leave it to Mom. To fill in some of the white spaces I stamped in the large outline circle from Scenery: Big Bang Confetti in salty ocean and sequins fit perfectly inside those open circles. The edges of the panel are lightly inked and adhered with dimensional adhesive to a navy cardstock base with a small scalloped patterned paper from the Maggie Holmes/Crate Paper Flea Market 6x6 paper pad die cut using the Femme Frames by Mama Elephant. 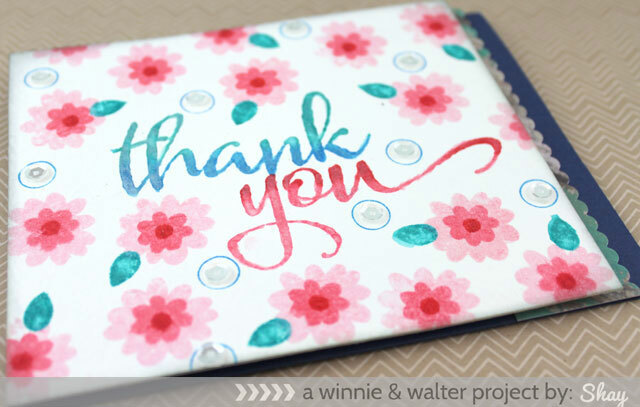 I hope you've enjoyed today's thank you card and we would love to see yours too! Link up on our join in to win! page for a chance to win a stamp set of your choice. Shay, your card is so sweet. 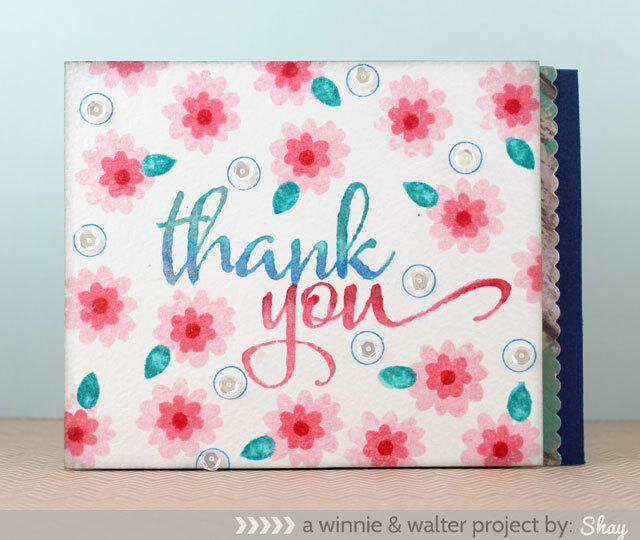 I love the shaded sentiment with the distress and the floral background is gorgeous. Thank you for the tutorial too.